Raspberry flavoured cupcake topped with cream cheese icing. Divulge into the Goodness! Order Red Velvet Cake Online Life becomes easy, if there is red velvet cake to be eaten. 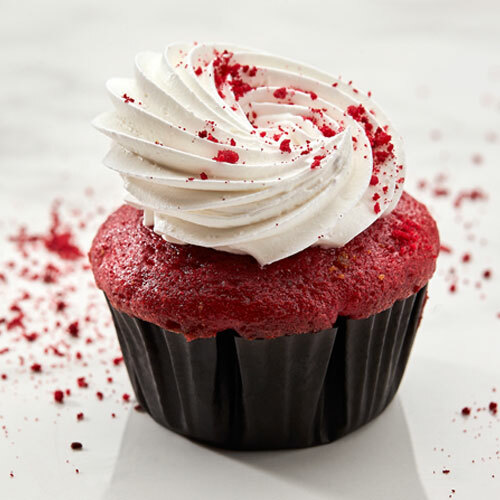 With our skilled bakers using fine-quality ingredients and utmost dedication to prepare red velvet cupcakes, they are sure to melt your heart away. Supporting a velvety texture and an exotic raspberry flavor, these cupcakes are topped with a white contrast of cream cheese icing. You can buy red velvet cakes online on our website, ensuring timely delivery according to your convenience including one day delivery as well. Red Velvet cakes, with their exquisite taste and aesthetic appeal are ideal for every special occasion from birthdays, anniversaries to Christmas and Valentine’s Day. Surprise your family, friends and loved ones with red velvet cupcakes, making their special day even more memorable. Unparalleled quality and extremely reliable delivery system ensures you feel an exceptional online shopping experience every time you place an order with us.